1 Lophophaena cf. capito Ehrenberg; dorsal view, VS-R-71a, 1-3cm, F10/4, 350x. 2-3 Dietyophimus cf. 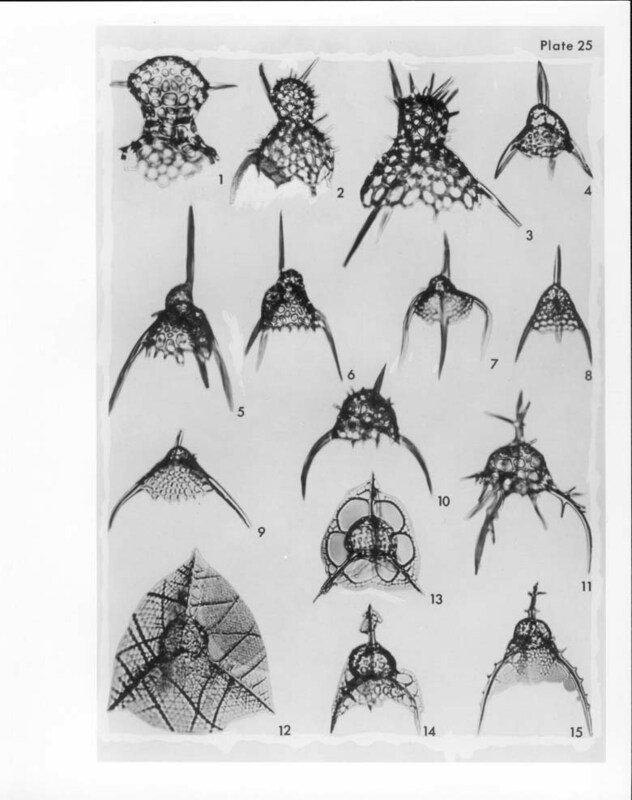 tripus Haeckel; 2, right lateral view, VS-R-106b, 1-3cm, Y30/3, 300x; 3, right lateral view,VS-R-81a, 1-3cm, U49/0, 300x. 4-6 Dictyophimus gracilipes Bailey; 4, 1eft latero-ventral view, VS-R-71a, 1-3cm, R24/1, 300x; 5, left lateral view, VS-R-60b, 3-5cm, K51/2, 300x; 6, right lateral view, VS-R-151a, 1-3cm, Y45/2, 300x. 7-9 Dictyophimus platycephalus Haeckel; 7, left lateral view, VS-R-60b, 3-5cm, K22/0, 300x; 8, dorsal view, VS-R-81a, 1-3cm, E34/0, 300x; 9, right lateral view, VS-R-91Bb, 1-3cm, J12/0, 300x. 10-11 Cladoscenium cf. tricolpum (Haeckel) Jörgensen; 10, left latero- ventral view, left lateral leg broken, VS-R-115a, 1-3cm, M12/4, 300x; 11, ventro-right lateral view, VS-R-151a, 1-3cm, X40/0, 300x. 12 Callimitra emmae Haeckel; VS-R-81a, 1-3cm, S21/2, 300x. 13-15 Clathrocorys murrayi Haeckel; 13, VS-R-81a, 1-3cm, R19/1, 300x; 14, VS-R-115a, 1-3cm, N14/4, 300x; 15, VS-R-81a, -1-3cm, O42/2, 300x.